Gary A. David has been intrigued by the of the Four Corners region of the United States since his initial trip there in 1987. The following year he sojourned in northern New Mexico where he studied rock art and indigenous ruins. In late 1994 he moved to Arizona and began an intensive research of the ancestral Puebloans and their descendants the Hopi. This has resulted in a work in progress entitled The Orion Zone: Ancient Star Cites of the American Southwest. Recently his articles have appeared in Ancient American and Atlantis Rising magazines, and on the CD Rom magazine Duat. He earned a Bachelor of Arts degree from Kent State University and a Master of Arts in the literature of the American West from the University of Colorado. He is the author of a number of books, including A Log of Deadwood: a Postmodern Epic of the South Dakota Gold Rush (North Atlantic Books, Berkeley, 1993) and Tierra Zia: Poems and Petroglyphs from New Mexico (nine muses books, Winston, Oregon, 1996), both available from Amazon.com. Mr. David is also editor, publisher, and webmaster for Island Hills Books. 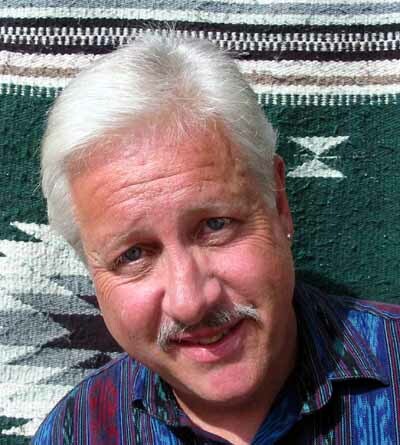 David has worked as a college instructor of English and creative writing, a traveling ambassador for the South Dakota Arts Council, and a professional guitarist and singer. He currently lives in rural northern Arizona where, thankfully, the skies are still relatively pristine. I am a pahana. I am a wasichu. But I am not a fat taker, the literal meaning for white person in Lakota (Sioux). Despite the mere eleven years I have lived with my family in rural Arizona, I have learned to cherish this land as if coming home. In one sense non-Indians probably can never truly be home on North American continent. On the other hand, I believe that with a lot of discipline and a little luck a few are able to at least touch upon its unique spirit of place. Before moving to the Four Corners region, I resided for nearly fifteen years in South Dakota, where I was an instructor of English composition at Oglala Lakota College on Pine Ridge Reservation. I also taught creative writing for the State arts council at Todd County High School on the Rosebud Reservation. In addition, I served as a proud member of the CIA (Cowboy and Indian Alliance), which I helped to found in 1987. This ad hoc organization was instrumental in halting the Honeywell Corporations plans to build a testing site for radioactive munitions in the sacred He Sapa (Black Hills). It also garnered the support of notable Lakotas such as Charlotte Black Elk (great granddaughter of the Black Elk Speaks narrator) and AIM member Dennis Banks, as well as many on the tribal council. I have participated in genuine Lakota inipis (not New Age sweat lodges) led by elders such as Reginald Bird Horse of the Standing Rock Reservation, and I prayerfully supported the dancers at a wiwanyag wacipi (sun dance) on the Rosebud. Born and raised near Cleveland, Ohio (where the only Indians I experienced were the baseball team), I earned a bachelor's degree in English from Kent State University (1974) and a master's degree in the literature of the American West from the University of Colorado, Boulder (1992). In my book titled The Orion Zone: Ancient Star Cities of the American Southwest, I reveal no sacred lore or secrets of Hopi spirituality. The occasional ceremonial details described are already part of common knowledge, most of which is available in any substantial college library (in my case, primarily Northern Arizona University). For better or worse, early ethnography has already let the genie out of the bottle. This is simply a case of freedom of religion (to remain concealed) clashing with freedom of speech (to be revealed). In my writing process, however, no Hopi elders, medicine people, or indigenous healers were ever consulted. Instead I relied on my own idiosyncratic perceptions, fleeting intuitions, and assiduous research to describe the star pattern of the constellation Orion projected upon the high desert of the Colorado Plateau. During frequent trips to the Hopi Mesas at my own expense, I witnessed numerous katsina dances and encountered certain elements about which I chose not to write. I have tried to respect the wishes of the Hopi for their utmost privacy in spiritual matters. If I have inadvertently discussed something that otherwise should have remained hidden, I am deeply sorry. My goal in doing this research is not financial gain. Although a few of my articles on the subject have been published in national magazines, I can honestly say that thus far I have made no money from them, nor have I received any benefits whatsoever, other than a few extra copies of the publications. I have given no workshops, no seminars, no lectures. Although I was formerly a college intructor, I am currently not employed by or associated with any institution, school, foundation, corporation, or agency. To date, I have given just two radio interviews, for which I was paid nothing. The fabrication of Hopi rituals or the facile mimicry of the Hopi way of life by non-Hopis is utterly distasteful to me, especially if a profit motive is involved. Sooner or later, the charlatans and exploiters will be recognized and discredited. I do not wish to speak for the Hopi people, only for myself. I do, however, wish to speak to the Hopi, establishing a dialogue as a bridge between cultures. My goal is not to obtain any restricted religious or ceremonial information, but instead to see if my findings are verified in Hopi cosmology and ontology. Perhaps the Orion correlation in Arizona is just one gigantic coincidence, or, more precisely, one small coincidence piled upon another upon another upon another, etc. Personally I do not think so, or I would not have worked almost full time for over seven years to elucidate this mystery. The elegant complexity of this celestial template both intrigues and bewilders me. If nothing else, one must admire the vision and tenacity of the Hisatsinom (Ancient Ones) who conceived and implemented it over the course of three centuries. Time will tell whether this mirroring of sky and earth is merely the fanciful yearnings of a misguided Pahana or the true cultural heritage of the Hopi.